In the last four articles in this series, we have discussed SQL injection, XSS, CSRF, XST and XSHM attacks, and security solutions. This article focuses on attacks exploiting the HTTP message architecture in the client-proxy-server system. Let’s look at each of these, individually. Also known as a CRLF injection, this attack causes a vulnerable Web server to respond to a maliciously crafted request by sending an HTTP response stream which is interpreted as two separate responses instead of a single one. This is possible when user-controlled input is used, without validation, as part of the response headers. An attacker can have the victim interpret the injected header as being a response to a second dummy request, thereby causing the crafted contents to be displayed, and possibly cached. Identifies user-controllable input that causes arbitrary HTTP header injection. Crafts a malicious input consisting of data to terminate the original response and start a second response with headers controlled by the attacker. Causes the victim to send two requests to the server. The first request consists of maliciously crafted input to be used as part of HTTP response headers, and the second is a dummy request so that the victim interprets the split response as belonging to the second request. This attack is generally carried out in Web applications by injecting malicious or unexpected characters in user input, which is used for a 3xx Redirect, in the Location or Set−Cookie header. It is mainly possible due to the lack of validation of user input, for characters such as CR (Carriage Return= %0d = \r) and LF (Line Feed= %0a = \n). In such Web applications, a code such as \r\n is injected in one of its many encoded forms. Requests to this page such as http://test.example.com/~arpit/redirect.php?page=http://www.example.com would redirect the user’s browser to http://www.example.com. Let’s look at the HTTP headers during this session. Now, the server will respond with a normal 200 OK response, and the user will see the Web page loaded from www.example.com. The “usual” HTTP headers above can also be visualised as shown in Figure 1. 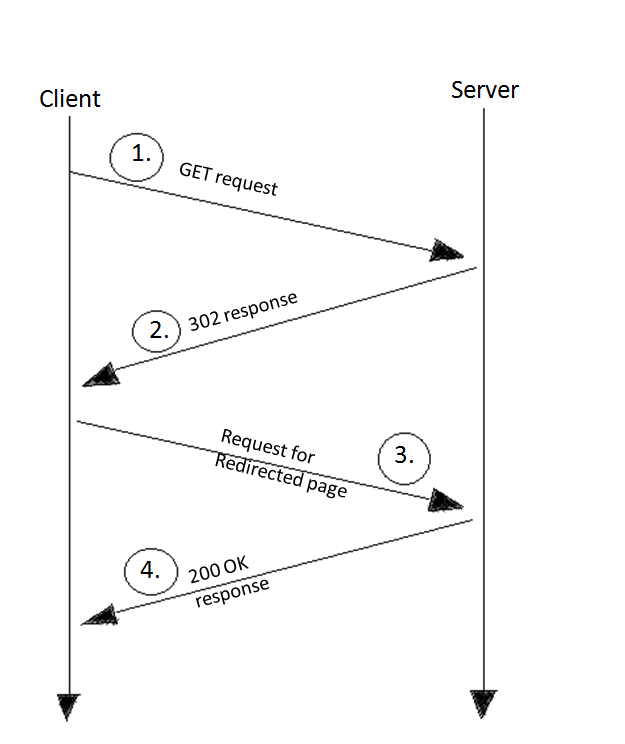 As we can see in the exploitation process above, the server runs the normal 302 response, but the arbitrary input in the location header causes it to start a new 200 OK response, which shows our input data to the victim as a normal Web server response. Hence, the victim will see a Web page with the text HACKED. The overall steps are shown in Figure 2. This example is a simple case of XSS exploitation using an HTTP response-splitting vulnerability. Apart from this, an attacker can also do Web cache poisoning, cross-user attacks, and browser cache poisoning. Cross user attacks: In cross-user attacks, the second response sent by the Web server may be misinterpreted as a response to a different request, possibly one made by another user sharing the same TCP connection with the server. In this way, a request from one user is served to another. To perform cache poisoning, the attacker will simply add a “Last-Modified” header in the injected part (to cache the malicious Web page as long as the Last-Modified header, it is sent with a date ahead of the current date). Moreover, adding Cache-Control: no-cache and/or Pragma: no-cache in the injected part will cause non-cached websites to be added to the cache. The best way to avoid HTTP splitting vulnerabilities is to parse all user inputs for CR/LF, i.e, \r\n, %0d%0a, or any other forms of encoding these (or other such malicious characters), before using them in any kind of HTTP headers. Properly escaping the URI at every place where it is present in the HTTP message, like in the HTTP Location Header; then CRLF (/r, /n) will not be parsed by the browser. The myth that using SSL saves one from attacks is not true; it still leaves the browser cache and post-SSL termination uncovered. Don’t rely on SSL to save you from this attack. For more attack vectors and solutions to them, don’t forget to visit the Resources section at the end of this article. HTTP request smuggling attacks are aimed at distributed systems that handle HTTP requests (especially those that contain embedded requests) in different ways. Such differences can be exploited in servers or applications that pass HTTP requests along to another server, directly — like proxies, cache servers, or firewalls. If the intermediate server interprets the request one way (thus seeing a request in a particular way), and the downstream server interprets it another way (reading the request in a different way), then responses will not be associated with the correct requests. Hence, the intermediary device, which should protect the network from dangerous HTTP requests, treats the malicious request as data, while the server can interpret it as a proper request. This dissociation could cause cache poisoning or cross-site scripting (XSS), with the result that the user could be shown inappropriate content. Alternatively, it could cause firewall protection to be bypassed, or cause disruption of response-request tracking and sequencing, thus increasing the vulnerability of your server to additional, possibly even more serious, attacks. Why does it work? Request smuggling exploits the way in which HTTP end-points parse and interpret the protocol, and counts on the lax enforcement of the HTTP specification (RFC 2616). RFC 2616 specifies that there should be one, and only one, Content-Length header. But, by using multiple Content-Length headers, it is possible to confuse proxies and bypass some Web application firewalls, because of the way in which they interpret the HTTP headers. This is partly because RFC 2616 does not specify the behaviour of an endpoint when receiving multiple HTTP headers, and partly because end-points have always been more forgiving of clients that take liberties with the HTTP protocol than they should be. So some end-points ignore the first, or the second, and then use the data included in Content-Length to parse the request. This can be used to direct proxies to treat requests as data, and vice-versa, which can confuse end-points, and trick them into executing malicious requests hidden inside legitimate requests. This particular case depicts the Web-cache-poisoning attack that uses request smuggling. It involves sending a set of HTTP requests to a system comprising of a Web server (www.example.com) and a caching-proxy server. Here, the attacker’s goal is to make the cache server cache the content of www.example.com/resource_denied.html instead of www.example.com/welcome.html. Note: For a successful request-smuggling attack, there should be an XSS vulnerability in the Web application. for http://www.example.com/welcome.html. Now, till the cache entry expires, the cache server will deliver cached copies of resource_denied.html to victims who request welcome.html. This example is a case of partial Web-cache poisoning (see Figure 3), because full control over the cached content is not given to the attackers. Moreover, they have no direct control over the returned HTTP headers, and more importantly, the attackers have to use an existing (and cacheable) page in the target website for their content (in the above case, resource_denied.html). However, besides this, the attackers can also bypass firewalls/IDS/IPS and steal authentication credentials — of course, that’s not a big deal now. To explore more about request smuggling, don’t forget to check the Resources section at the end of the article. Install Web application firewalls, which protect against HRS attacks. A few firewalls are still vulnerable to HRS attacks; check with the firewall vendors whether their products offer protection against HRS or not. Apply strong session-management techniques. Terminate the session after each request. Turn off TCP connection sharing on the intermediate devices. TCP connection sharing improves performance, but allows attackers to smuggle HTTP requests. Turn on non-cache for all pages. For more details refer to www.web-caching.com. These attacks force the victim’s browser to send multiple HTTP requests instead of a single request. Two mechanisms have been exploited to date, for this attack: the XmlHttpRequest object (XHR for short) and the HTTP digest authentication mechanism. For this attack to work, the victim must use a forward HTTP proxy. In order to split the HTTP request, CRLFs are injected into the request. Note: The above code will work for Internet Explorer; the modifications required for Mozilla are commented so you can just uncomment them as required. Hence, it will respond with two HTTP responses. The first response (http://www.attacker.com/page1.html) will be consumed by the XHR object itself, and the second (http://www.attacker.com/page2.html) will wait in the browser’s response queue until the browser requests http://www.example.com/index.html (because window.open() will now execute). Now, the browser will match the response from http://www.attacker.com/page2.html to the request for the URL http://www.target.com/index.html, and will display the attacker’s page in the window, with that URL!! Important Note: In the above attack, we have used horizontal tabs (\t) instead of simple spaces, because IE doesn’t allow spaces in the method parameter of x.open(). The reason we have used HTTP/1.0 is that HTTP/1.1 strictly requires using only space, while HTTP/1.0 doesn’t have such restrictions. The malicious script executed by the victim’s browser sends only one request, but the proxy receives two HTTP requests (potentially to different origin domains), hence the proxy responds with two different HTTP responses. It is good if site owners use SSL for protection. Eliminating XSS entirely will definitely help a lot. There are also suggestions for blocking HTTP/1.0 requests to the Web server. Though this will work, it will also block the entry of the Web crawlers and spiders of major search engines, because those mostly use HTTP/1.0. Follow the security tips given for the previous attacks (especially parsing all the user input for CRLFs). This is an attack that occurs very rarely. In this case, an attacker smuggles two HTTP responses from a server to a client, through an intermediary HTTP device that allows a single response from the server. To do this, it takes advantage of inconsistent or incorrect interpretations of the HTTP protocol by various applications. For example, it might use different block-terminating characters (CR or LF alone), adding duplicate header fields that browsers interpret as belonging to separate responses, or other techniques. The consequences of this attack can include response-splitting, cross-site scripting, apparent defacement of targeted sites, cache poisoning, or similar actions. This attack is most useful in evading anti-HTTP-response-splitting (anti-HRS) mechanisms. For this to happen, the targeted server must allow the attacker to insert content that will appear in the server’s response. 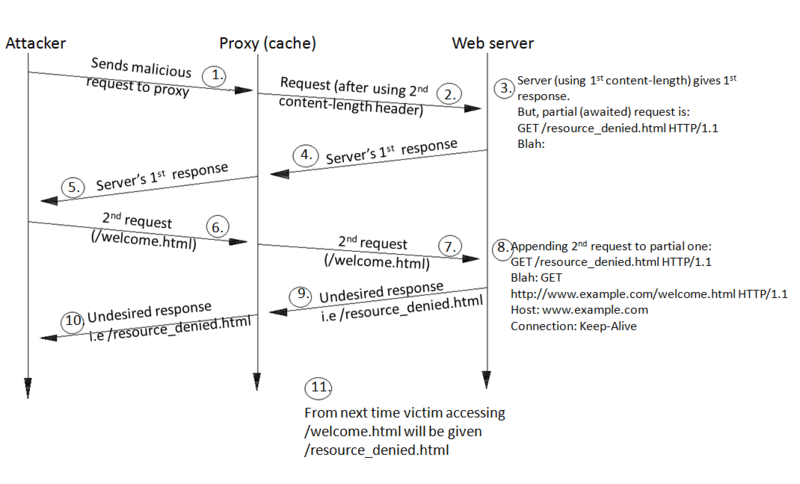 HTTP response smuggling makes use of HTTP request smuggling-like techniques to exploit the discrepancies between what an anti-HRS mechanism (or a proxy server) would consider to be the HTTP response stream, and the response stream as parsed by a proxy server (or a browser). So, while an anti-HRS mechanism may consider a particular response stream harmless (a single HTTP response), a proxy/browser may still parse it as two HTTP responses, and hence be susceptible to all the outcomes of the original HTTP-response-splitting technique (in the first use case), or be susceptible to page spoofing (in the second case). For example, some anti-HRS mechanisms in use by certain application engines forbid the application from inserting a header containing CR+LF to the response. Yet, an attacker can force the application to insert a header containing LFs only, or CRs only, thereby circumventing the defense mechanism. Some proxy servers may still treat CR (only) as a header (and response) separator, and as such, the combination of the Web server and proxy server will still be vulnerable to an attack that may poison the proxy’s cache. Now, since this attack has a lot more dependencies (which is why it is rare) I request you to visit the resources below to get a good hold on this. As for security measures, strictly adhere to interpretations of HTTP messages wherever possible. (Remember: no CRs and no LFs.) Moreover, encoding header information provided by user input (so that user-supplied content is not interpreted by intermediaries) is also a good way to handle the attack. Finally, reject any non RFC-compliant responses. All the examples and attack scenarios explained above are just for educational purposes. I once again stress that neither I nor LFY aim to teach readers how to attack servers. Rather, the attack techniques are meant to give you the knowledge that you need to protect your own infrastructure. We will deal with other dangerous attacks on Web applications and Apache in the next article. Excellent article which clears the basics. Thanks and keep going.